The French press brewing method continues to be one of the favorite ways of making a cup of Joe among home baristas. Now, as you will know if you practice the French press process, the correct grind is crucial to producing a perfect brew. Of course, the higher the quality your beans, the better flavor your brew will have. But even the most expensive Kona beans money can buy won’t taste as wonderful as they should if you get the grind wrong. Beginners may be happy beginning their barista journey by using pre-ground coffee to make a beverage using the French press, but if you’re a true coffee aficionado, you’ll already be grinding your beans yourself. Well, the French press method needs a medium to coarse grind for best results. That’s because maximum water surface area is necessary for full flavor extraction. The bottom line is that most pre-ground coffee is usually too fine to work well in a French press. Very finely ground coffee will slip through most mesh filters, leaving behind an unpleasant, gritty slurry in your cup. Also, a coarse grind will produce a much brighter, more vibrant flavor when used in a French press. So, what kind of coffee grinder should you buy? Okay, so now you need to buy yourself a high-quality grinder. But to muddy the waters, there are several variations and types of coffee grinders from which to choose. We’ll talk more about the various forms of grinders later in this article, but suffice it to say that the best coffee grinder for French press is a burr coffee grinder. Well, there is science to the art of grinding coffee. Pay attention; this is important. Coffee beans are comprised of soluble solids, which must be extracted from the grind into the brew. It’s essential that the correct balance is achieved during this process to yield the best flavor from the beans. Ideally, the brew strength for a cup of French press coffee is around 98.5 percent water to between 1.15 to 1.35 percent of brewed solids. As we mentioned earlier, proper extraction occurs only across the maximum water surface area. Grind size has a direct impact on the surface area. French press coffee needs between 100 and 300 particles of grounds for the perfect result, whereas espresso needs much more, around 3,500 particles. Also, uniform coffee grind size is essential for the perfect brew. Unevenly ground coffee can result in either under or over-extraction, producing a bitter-tasting brew. Particle size also impacts brew time. Therefore, when the particle size, uniformity of grind size, and correct brewing time are all right, the stars align, and you will have a perfect cup of French press coffee. A good-quality burr grinder will give you uniformity of grind and the correct particle size. However, getting the brewing time right is in your hands! Blade grinders are very popular because they are quick to use and considerably cheaper than burr grinders. Also, they effectively chop up the coffee beans into grounds, which are then caught in a container. Although a blade grinder will ultimately produce a coarse grind, which is perfect for French press, the uniformity of the grind will not match that produced by a burr grinder. Also, some blade grinders spin the blades so quickly that they generate heat, burning the coffee and destroying the valuable oils it contains. The most precise grind is produced by disc and conical burr grinders. The coffee beans fall between two discs or cones that have grooves cut into their surface. One disc or cone rotates while the other is stationary. The grooves slice into the beans, resulting in a consistent grind. A disc or conical burr grinder will certainly do a fabulous job of grinding coffee for French press, but they are generally more expensive than blade grinders. 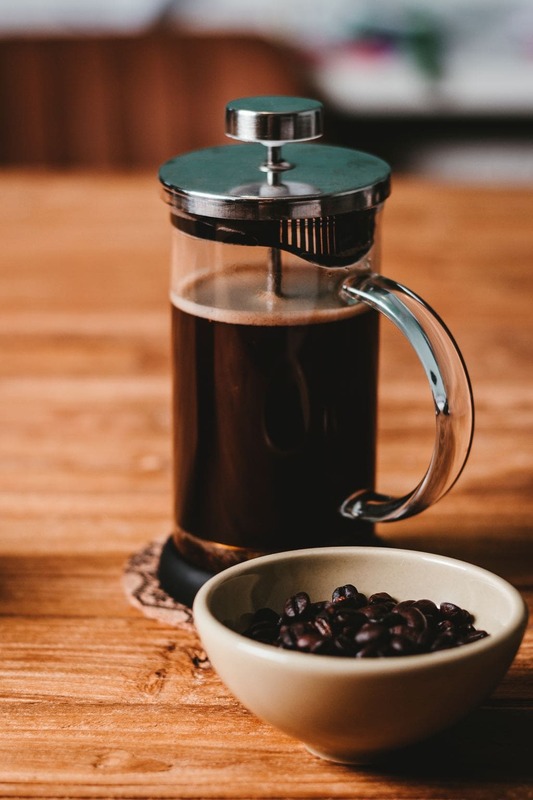 So, now we’ve established that you want a burr grinder to get the very best grind for your French press, let’s take a look at five of the best coffee grinders we could find. The Hand-ground Precision coffee grinder sits in the higher end of the price point range and is a great ceramic burr grinder. It’s a perfect addition to the experienced home barista’s caffeinating kit. The grinder has eight different settings from fine right through to coarse, specially designed for French press coffee. Not only that, the clever monkeys who designed this piece added an extra half-step between each setting. That means you have a total of 15 different coarseness settings to choose from. The hopper holds up to 100 grams of coffee beans. The hopper top is lockable to keep the beans securely inside while you’re grinding. The handle is side-mounted, making it much easier to operate than traditional top-mounted style grinders that can become unstable. The all-important conical ceramic burr mill crushes the coffee beans into a consistent particle size, resulting in a uniform grind that makes perfect French press coffee. Central to the burr mill is a stainless steel axle that’s mounted on metal bushings to ensure stability while you grind. The Hand-ground is quick and easy to disassemble and clean. You simply palm-turn the inner burr and slide out the burr mill. 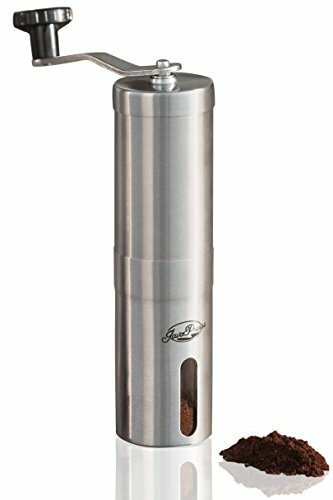 The JavaPresse manual coffee grinder is an Amazon best-seller. 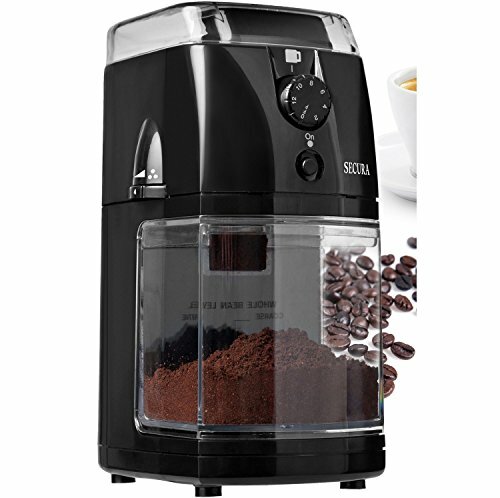 This coffee grinder boasts a remarkable number of features and is extremely high-quality for such a low price point. The grinder allows you over 18 simple click settings, giving you total control over the coarseness of your grind. The unit is very compact and portable; perfect if you travel or like to brew your French press cup of Joe when you’re away camping. The hand crank mechanism is smooth and virtually silent. The ceramic burrs are rigorously tested to ensure that they will last up to five times longer than stainless steel blades. 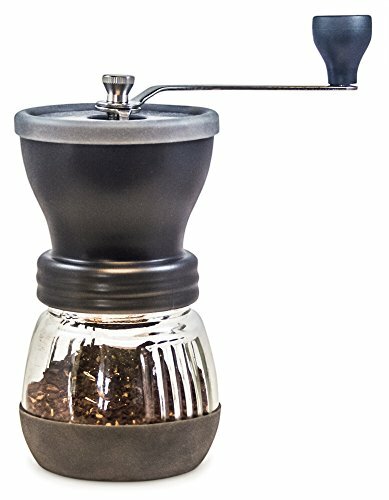 This grinder is absolutely perfect if you only want to grind a small amount of coffee while on the road. Those who like to prep their Java in large batches might want to choose a grinder with more capacity. Khaw-Fee’s manual grinder gives you excellent value for money. Unlike some cheaper manual grinders that use plastic parts, this grinder uses stainless steel, has a conical ceramic burr, and a smart glass coffee jar. The grinder is super-quiet and has a smooth, easy-to-use, crank handle. The unit is small enough to be portable too, so if you want to grind your French press coffee at work or when you’re traveling, you can. The unit has a wide range of coarseness settings so that you can choose the perfect size of grind for French press. The company is so confident in the quality and reliability of their product that they offer a lifetime warranty. In a nutshell, if you don’t like their product, simply return it, and they will refund your money without quibble. For those of you who aren’t confident that you can manually produce the perfect grind for French press coffee, you may find an electric burr grinder is a better choice for you. 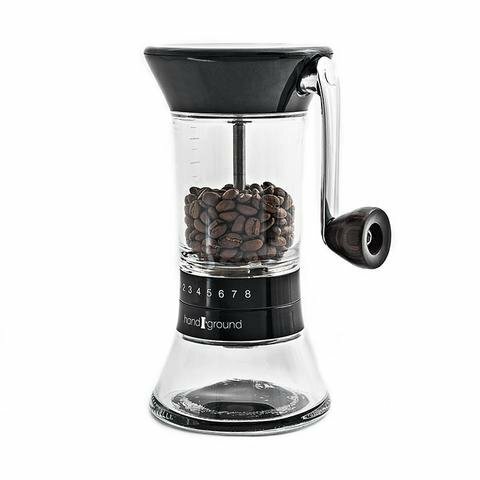 The Secura electric burr grinder offers you no fewer than 17 grind sizes from extremely fine through to coarse. With that much flexibility, you’re sure to find the perfect grind for your French press process. The burr grinding mechanism ensures that you’ll enjoy a uniform grind every time. You can choose to grind enough coffee for two to 12 cups, and the unit has a handy automatic shut-off feature. The grinder is compact enough to fit neatly onto your kitchen counter without taking up too much space. In case of problems, the maker offers a two-year limited warranty. This high-quality coffee grinder sits surprisingly in the mid-range price point and is not that much more expensive to buy than most manual grinders. If you are serious about grinding coffee for your French press, you’ll want to consider taking one of these babies home. 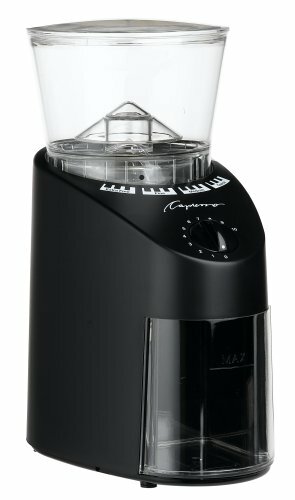 The Capresso conical burr coffee grinder is a commercial-grade machine that has solid, conical steel burrs for high-precision grinding. The grinding range that this machine offers ranges from ultra-fine to coarse. The transparent bean container holds up to 8.8 ounces of beans, and the tightly fitting coffee container takes up to 4 ounces of ground coffee. The motor is operated by a unique gear reduction system that reduces noise and limits static build-up. The machine has the slowest grinding speed in its class, creating less friction and heat, so your coffee will retain maximum aroma and flavor, no matter which grind setting you choose. Although this coffee grinder will set you back a few more dollars than other machines, the investment will be well worth it for the quality of the finished grind. What makes the perfect grinder for French press coffee? As we mentioned earlier, there are a number of factors that you’ll need to consider when choosing the best grinder for French press coffee. As we’ve previously mentioned, it’s crucial to the quality of your brew that the size of the particles created during the grind is consistent. A burr grinder of decent quality should give you that elusive consistency that’s so important. Another factor that will have a detrimental effect on the quality of your brew is a dirty grinder. Now, obviously, you’re going to clean your coffee grinder after each use (yes, you absolutely are.) But the grinder you choose must have excellent personal hygiene standards too. That means that the grinder expels all the grinds. Some grinders have a nasty habit of retaining a residue of grounds from your previous batch. Those grounds will quickly become stale, tainting the flavor of future batches. A lesser known problem with electric coffee grinders is that some create static. Static can affect the uniformity of the grind, leading to imperfect flavor extraction during the steeping process, and resulting in a substandard brew. The coffee grinder you choose must allow you total flexibility and control over the coarseness of the grind. Try to find a grinder that has a wide range of settings, rather than just a few. The more settings you have at your disposal, the easier it will be for you to find one that gives you the precise degree of coarseness you want for perfect French press performance. Okay, so now you know what to look for in the perfect coffee grinder for your French press brewing process. That’s it, right? There are two different types of coffee grinder to choose from. As the more astute among you will have gleaned from the name, manual grinders are hand-operated. Manual grinders are the ultimate in traditional caffeinating. Also, they look totally cool on your countertop. To grind your coffee beans in a manual grinder, simply load the machine with your beans and grind them using the handle on top of the grinder. Manual grinders are super-easy to use and to keep clean. They’re also a very affordable option for those on a budget. The main disadvantage of a manual grinder is that you have to physically turn the handle to grind the beans. That can mean a certain degree of trial and error until you get the coarseness exactly right. Electric grinders effectively do the hard work for you. You load the coffee beans into the grinder, choose the setting you want, and let the machine do its job. The main drawback with electric grinders is that you have no control over the grind once it’s underway. However, a good quality, electric burr grinder will produce perfect French press coffee in a fraction of the time it would take you to do so with a manual machine. When it comes to the material used to make conical or disc burrs, the choice is either stainless steel or ceramic. Ceramic won’t rust, is pretty hard-wearing, and doesn’t conduct heat so it won’t spoil the flavor of your coffee by affecting the beans’ natural oils. Although ceramic is more prone to damage than steel, it will retain its sharpness for much longer. Stainless steel won’t rust and is hard-wearing, but it does conduct heat. Also, although stainless steel starts off sharper than ceramic, it dulls more quickly. For the full lowdown and to find out more about the debate over ceramic versus stainless steel coffee grinders, check out our article at this link. So, now you’re educated in the art of producing the perfect grind for French press coffee, you can order yourself a grinder, choose some super quality coffee beans, and look forward to French press perfection, every time. Ceramic vs. Stainless Steel Coffee Grinders: What’s the Difference? You can easily up your coffee game by grinding your own beans, but finding the right grinder for your preferences is not always easy. Read Ceramic vs Stainless steel coffee grinders to find out which one will work better for you. Looking to up your coffee game with your next machine purchase? A great way to do that is to find a machine that grinds your beans fresh for your brew. We've put together this piece to show you how to find the best coffee maker with grinder for your coffee needs to help you get started. Want to boost your coffee’s flavor? The magic is in the grinds. Coffee grinders extract flavor from the beans. Learn how to choose the best one for the job.